Un In was a big village of 250 people at the end of the 19th century. The map above (full background details of the map are provided in Tymon Mellor’s first article below) shows the locations of both the lead mine and Un-in village. The latter is north of Lead Mine Pass. 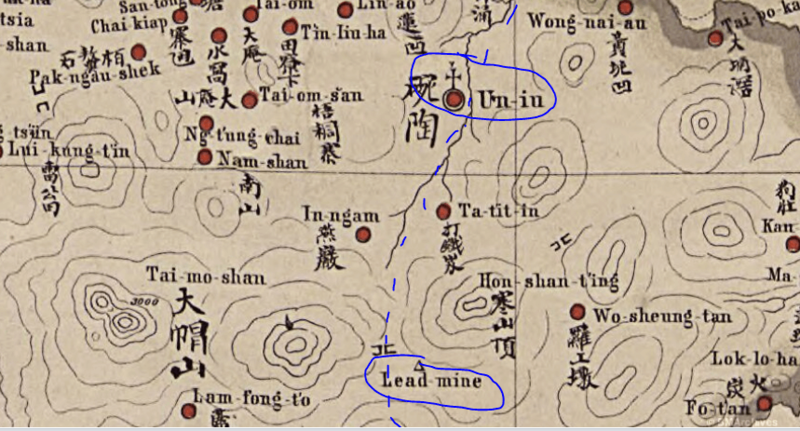 Tymon in his two articles suggests that the mine was in the area of what is now called Shing Mun Arboretum. That is south of Lead Mine Pass. Could Un In Gap in the 1908 report be what we now know as Lead Mine Pass? An overlay of a contemporary map onto the San On District shows Lead Mine Pass / and possibly Un In Gap? where five paths and roads come together directly north of the indicated Lean mine. Many thanks to Tymon Mellor for the maps. Bob Cheung was in contact in October 2015. He writes: The early presence of the words “lead mine pass” may indicate possible mining activities from an ancient period, that may be why the mine may be poorly organised and why we cannot expect very systematic ruins. In the other words, the lead ore may have been mined in trenches or small adits over the whole area of “lead mine pass”. This is possible as the ancient villagers did not predict the ore’s location but grabbed what they saw on the surface. If this the case, we may only rely on the Aerial Photos published by the Lands Department. The earliest available photos were taken in 1921 with limited coverage and I might be able to look at them in November. This article was first posted on 10th March 2014. The Un Iu quoted is actually present day (碗窰) Wun Yiu, the location for the pottery kiln mentioned in another article. 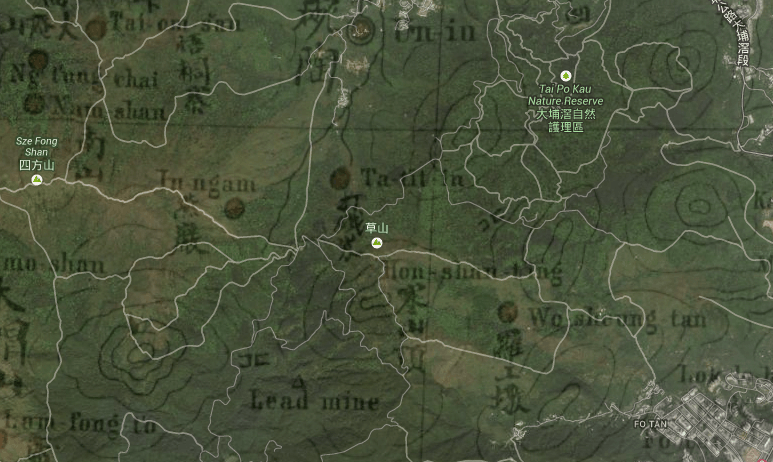 I recognized it by the Chinese name written in the old map. It would seem local dialect had been raising havoc for foreign speakers trying to make up the sound with alphabets.